The telecommunications market in Sri Lanka is small but rapidly developing. Today it is considered more mature than the neighboring markets of Bangladesh and Pakistan. But what about the sector of Internet services in the country? For effective voice termination, you need a stable Internet connection with a speed of 42 Kbps for each port of equipment. At the moment, Internet connectivity in Sri Lanka is 30% (which is about 6.26 million connections). Internet is not available in every district, which is primarily due to reduction in the number of fixed lines in the country. 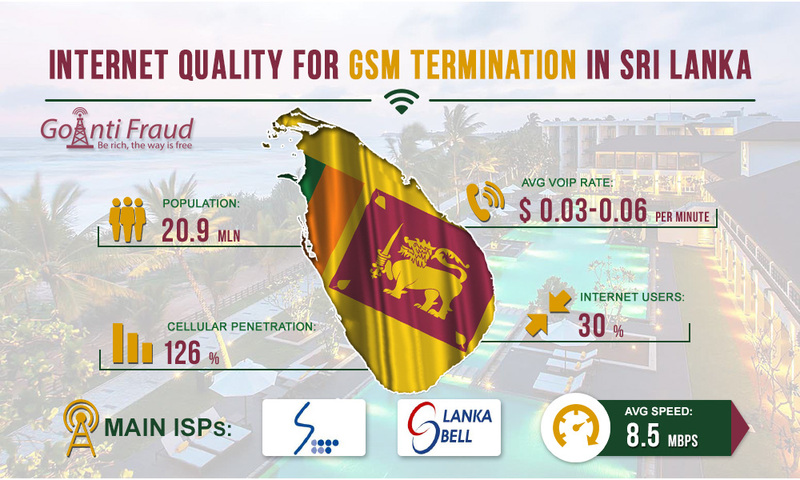 The mobile sector prevails in Sri Lanka, which is an excellent prerequisite for earning on termination, but at the same time, it holds back the development of broadband access segment. Most local residents use cellular communication and the fixed-line communication practically disappears, which reduces the number of ADSL networks. Nevertheless, the Internet services market in Sri Lanka has grown significantly over the past five to seven years. Experts predict further sustainable growth until 2020. At the same time, the country has a good average Internet connection speed of 8.5 Mbps, as of 2017. This speed is good enough for the full-scale operation of gsm gateway ip pbx for a large number of channels. Popular Internet providers in Sri Lanka are SLT (Sri Lanka Telecom), Lanka Bell. They use ADSL, Wi-Fi and Fiber-Optic technologies to provide Internet access. Look for more updates in our blog; we will publish an article on the Internet pricing in Sri Lanka very soon.